Steel hull, aluminium super structure, essential streamlining. 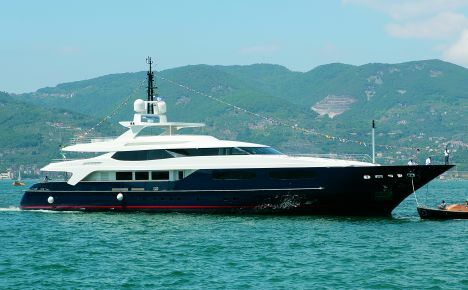 It is the new 53 metre displacing yacht built by Baglietto Shipyard, named "Blue Scorpion" and designed by Francesco Paszkowski, naval architect. There are a number of novelties on board: the large flying bridge offers an absolute "oasis" for the benefit and comfort of the owner and his guests. It comprises an oval table, a Jacuzzi hydromassage bath- tub surrounded by a semi-circular sofa and six comfortable 'sun deckers', the bows sport mechanically operated sun-shields. The other spaces on the yacht, cry lusciousness throughout thanks to the contrast between the light coloured wall to wall carpeting with the dark tones of the furnishings. The upper deck hosts a full gymnasium, a saloon and a wheel house finished in an intense China Blue; the pantry leading directly to the Captain's quarters is right next door. The saloon on the bridge comprises a living area fitted with comfortable small armchairs and an antique Chinese opium bed used as a sofa. The main deck hosts a dining area with a rectangular table, separated by the saloon by an intriguing antique bulkhead. The saloon is simply decorated evoking a warm oriental touch. The materials on board are quite rigorous, wengé wood flooring partly covered by coconut matting, and English oak furniture with wengè inlays. The galley comprises a central work-block complete with wine cellar and fridge cells below the port-hole. The owner's suite enjoys a privileged position in the bows complete with office and private services. The décor is minimal but elegant. The saloon and the stern cockpit which is decked out with sofas, small armchairs and coffee table, are separated by sliding doors. The sleeping quarters reserved for guests, are on the lower deck and they comprise: two large VIP cabins with King size bed and private bathroom, two further twin bedded cabins also served by en-suite bathroom and shower. The interior design is again essential and relies on the play of colours between light and dark furnishings. The bows also hosts the six cabins for the crew with relative bathrooms and dining areas which can be independently accessed from the upper deck. The stern houses a wheel-house control room separated from the engine room. The upper lower deck is equipped with four professional washing machines and eight freezers. Classed as: Lloyd Register - Malta Cross 100 A-1 SSC; Yacht Mono G6 LMC, UMS MCA Compliant.